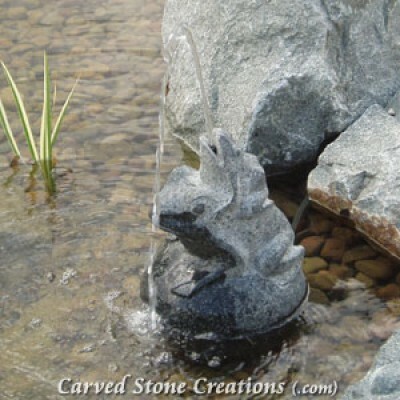 The sound of bubbling and flowing water creates a relaxing atmosphere in your garden or home. Bubbling fountains are low-pressure fountains that bubble water above or onto the surface of the fountain instead of shooting the water into the air like other fountain styles. Each bubbling fountain is unique with its own detailed carvings that come to life when water flows across the surface. These fountains come in many shapes, sizes and styles. View some popular bubbling fountain designs below. This fountain style is one of the most popular bubbling fountains. The different heights of the columns (pillars) create variety and interest. We recommend installing a pondless basin with this fountain style for the best look. 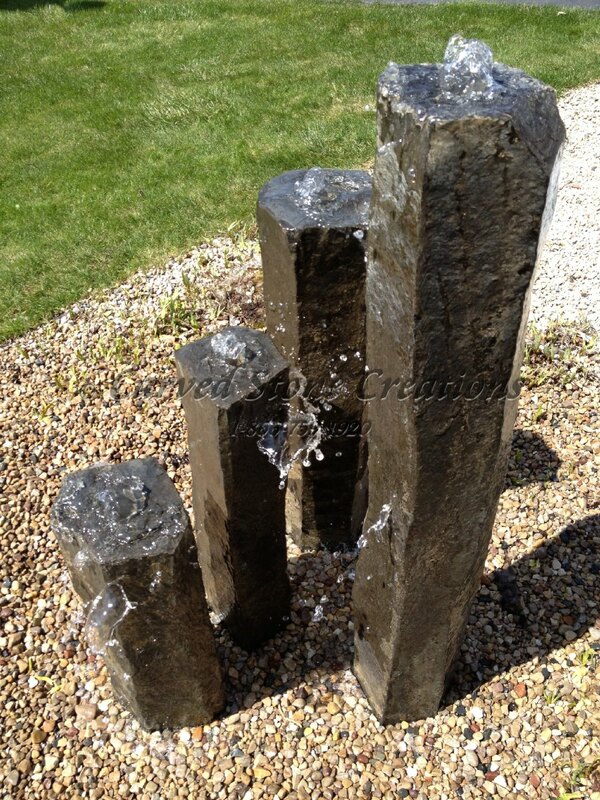 Basalt Column Fountains are available in 18-inch to over 7-feet tall. Take a closer look at this fountain here. This bubbling fountain is hand-carved from natural Mermaid Green Granite stone. It features two frogs with polished accents on top of a polished granite sphere. Add a playful touch to your garden space with this fountain. It works great in ponds, too. This contemporary style fountain is hand-carved from Giallo Fantasia Y Granite. The twist shape features alternating finishes on each side of the fountain including polished surfaces and rougher, rock-face finishes. The bubbling water will flow over the different textures of the fountain surface creating an interesting display. 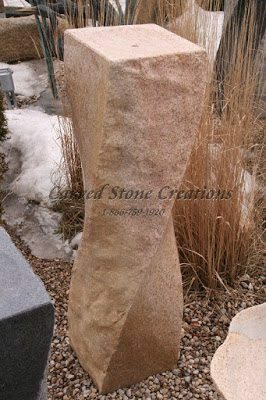 This rustic style fountain is created from natural basalt stone. It features taller corners that create a bowl shape in the center of the fountain. The bowl collects water before overflowing over the edges of the fountain into a basin (we suggest installing a pondless basin for the best results). 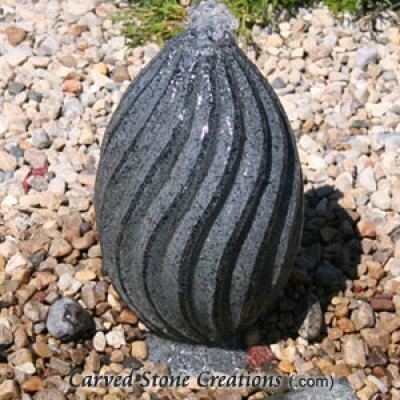 The graceful hand-carved spiral details enhance the shape of this charcoal grey granite fountain. The water bubbles out of this fountain and flows through the spiral details creating an attractive waterfall pattern. We suggest adding a pondless basin to your garden if you plan on using this fountain. Check out this fountain here. There are bubbling fountains available for every taste. Check out more bubbling fountain designs here. Custom size, shape, and colors are available. Contact us for more information on how to create a custom fountain that is uniquely yours.